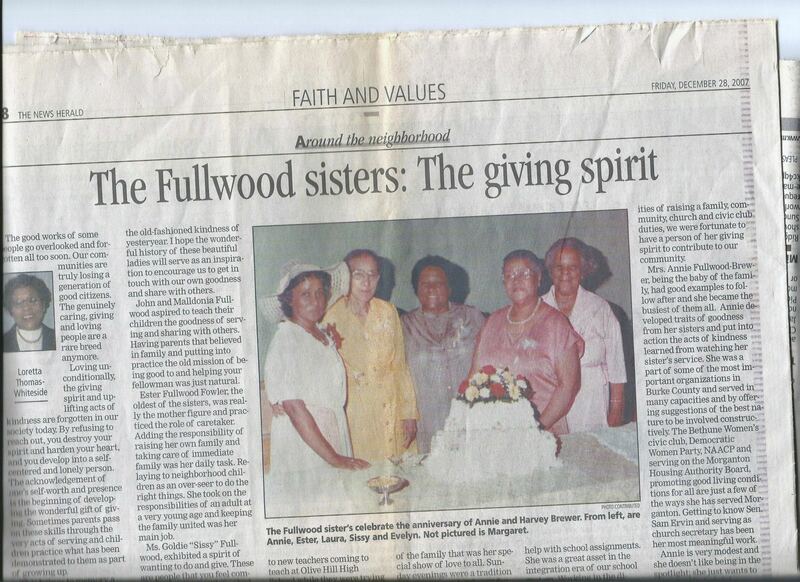 Photograph, from the 1980s, of my late grandmother and her sisters featured in a Morganton News Herald story on giving. My cousin Britt recently shared this photo as our family prepares for a reunion this summer. The original photograph was taken in May 1983 at my great-aunt Annie’s wedding anniversary party. It features my grandmother and four of her sisters: (l-r) Annie, Esther, Laura, Goldie and Evelyn, known to me at Nanny Evelyn. I am a fortunate heir to a prized legacy of giving. And I believe that a spirit of generosity prevails in my generation and in younger ones. Generosity does, however, need nurturing in children, and oftentimes adults too, through example, expectation and opportunity. The book Giving Back stands as a centerpiece of the Giving Back Project, which ventures to ignite a movement of conscientious philanthropy by empowering a generation of Americans to recognize their power and responsibility to give back. Along with others igniting this movement, I want to fan the flames—with my writing, my public speaking, my creative and artistic endeavors, my social media interactions, my giving and my life. This entry was posted in Family and tagged Annie, Britt, Esther, Evelyn, Family, Fullwood, generations, generosity, Giving Back A Tribute to Generations of African American Philanthropists, Goldie, great-aunts, John W. Fullwood, Maldonia, Ohiyesa, Religion and Spirituality by valaida. Bookmark the permalink. So proud. So grateful. So filled with emotion. This is a lovely family.